They are here! 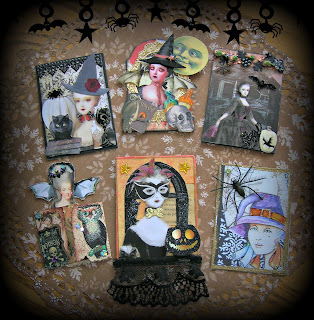 My wonderful returns from the Hallowen Marie ATC Swap in our Marie Antoinette Mail Art Group. They're fabulous, JoAnne! Great swap idea--love how they turned out! I love all of them! I'll have to post what I received. These Marie cards are great! I got my matchbox today and wow, it is spectacular. I got remarkably spoiled by Sarah. Thankyou for giving her to me as a partner. I will post it all soon and be sure to put in on the flickr site. She really did out do herself! Looks like you got spoiled too. I am in Halloween Heaven too! What a gorgeous swap, Joanne! Love how the cards turned out! Great set of Halloween Marie Antoinettes. It would be hard to pick a favourite, they are all darned good. Halloween would not be complete without beautiful Maries. Warmest hugs, sweetie.